A poem sent to Betty Turner's friend Billy to celebrate their 80th. Betty describes the wartime hardships she endured, hint at the bereavement after the loss of the men she loved, stresses the sense of duty toward her country, friendship and camaraderie. We joined the WAAF you & I, looking very smart, walked tall. Woolly ones for the winter so we didn’t freeze. One sheet per person per sitting was the total issue!! Certainly had no worries about the latest [deleted] indecipherable word [/deleted] trends. We loved & lost many times sometimes our hearts were broken. But secrets were [inserted] always [/inserted] kept & not a single word was spoken! Taught us how to deal with most any situation. But one things for sure, WAAF friendship is [deleted] my [/deleted] a [deleted] biggest [/deleted] perk! 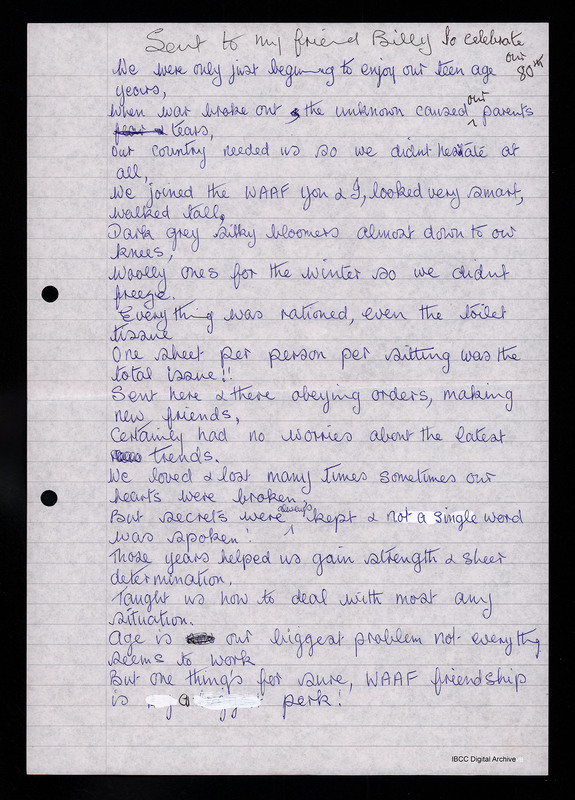 Betty Turner, “A poem to Billy,” IBCC Digital Archive, accessed April 24, 2019, https://ibccdigitalarchive.lincoln.ac.uk/omeka/collections/document/1272.